NATE spoke with Safety LMS’s very own President, JP Jones, about the importance of OSHA Safety Stand Down Week. JP is a chairman of NATE’s OSHA Relations Committee and a member of the NATE Board of Directors. OSHA Safety Stand Down week is a great time to take a step back from your day to day tasks and make sure your equipment, training and protocols are up to the current standards. From your safety equipment, training programs, and everything in between, contact us on how we we can help! Please read the article below released earlier today by NATE. 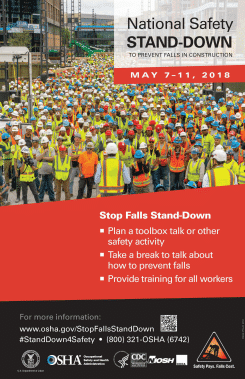 (Watertown, SD) – The National Association of Tower Erectors (NATE) is urging its members and all wireless industry companies and stakeholders to actively participate in next week’s OSHA National Safety Stand-Down to Prevent Falls in Construction. NATE and OSHA are requesting that employers set aside time throughout this week to facilitate safety meetings and activities in order to have an open discussion with their workers about industry safety and fall prevention. The National Safety Stand-Down raises fall hazard awareness across the country in an effort to stop fall fatalities and injuries. Additionally, to register to participate in one of NATE’s upcoming 2018 Rigger Awareness Training Courses, CLICK HERE. The Rigger Awareness Training Courses are offered due to an OSHA Susan Harwood Training Grant (SH-31235-SH7) the Association received. National Association of Tower Erectors (NATE) is a non-profit trade association in the wireless infrastructure industry providing a unified voice for tower erection, service and maintenance companies. Today the Association boasts over 830 member companies located throughout the United States, Australia, Bahamas, Canada, Ghana, Jamaica, Philippines, Puerto Rico, Saudi Arabia, Singapore, Trinidad and the United Kingdom. For additional information on NATE, please visit www.natehome.com.